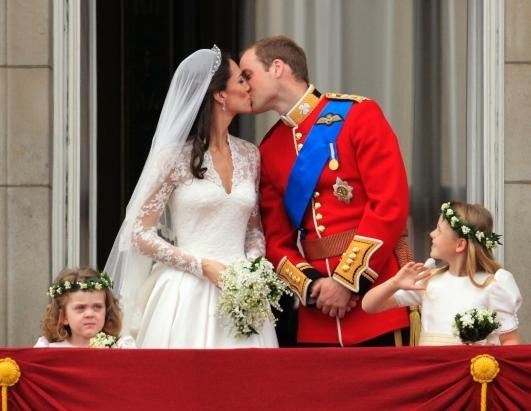 On the most important day of her life, Kate Middleton married her Prince in front of millions of viewers worldwide. 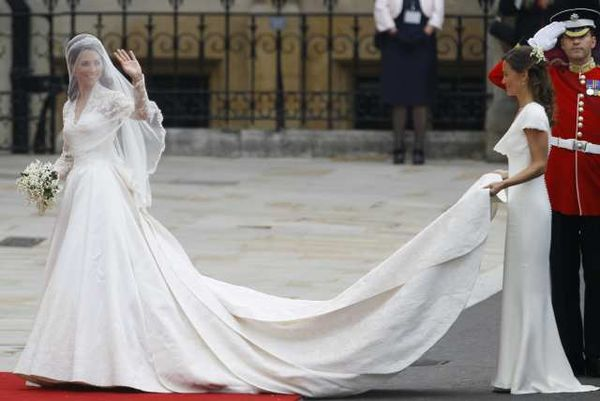 And when Kate stepped out of her car, fashionistas everywhere finally learned who designed her exquisite wedding gown, Sarah Burton for Alexander McQueen. The elegant ivory gown had long, Chantilly lace sleeves and a modern neckline. Her train and veil were modest, not overwhelming the bride during her walk down the aisle. Kate wore custom satin and lace pumps, also handmade by the team at Alexander McQueen. Atop her head was the stunning Cartier “halo” tiara, which was loaned to her by Queen Elizabeth II. Her delicate diamond earrings were the perfect finishing touch to her wedding day attire. Many are comparing Kate’s gown with the one worn by Princess Grace of Monaco, also a commoner who married in to the royal family. Both dresses featured a fitted bodice and lace sleeves, showcasing each bride’s feminine frame. Kate Middleton’s classic gown has already inspired many “knock offs” within the fashion world, from David’s Bridal and Faviana to A.B.S. by Allen Schwartz. Expect bridal stores and websites to be carrying replica gowns in a few short weeks, just in time for summer wedding season! Kate Middleton’s Engagement Ring For Less! 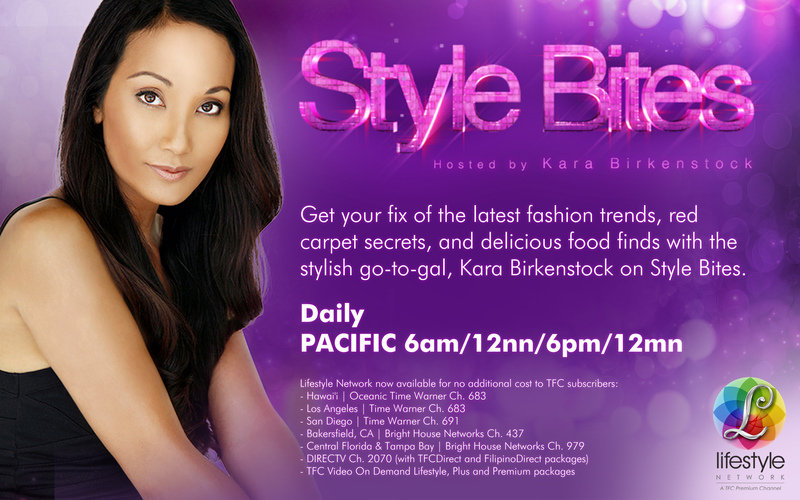 With the royal wedding fast approaching, many are keeping a close eye on the style savvy bride to be, Kate Middleton. Already setting trends before her walk down the aisle, Kate’s engagement ring has been the most talked about piece of jewelry since the Hope Diamond! Originally the engagement ring of the late Princess Diana, the stunning bauble was provided by Garrard in 1981, the official crown jewelers of the monarchy. At the time, the 18 carat oval blue sapphire ring, surrounded by 14 small diamonds, was reportedly worth 30,000 pounds ($65,000). Now on the hand of the future princess, the ring is truly a symbol of timeless elegance. As a royal fashionista, Kate’s ring is bringing colored gems to the forefront, particularly on engagement rings. While we all can’t have royal hand me downs like Kate, we can still achieve the look for less! 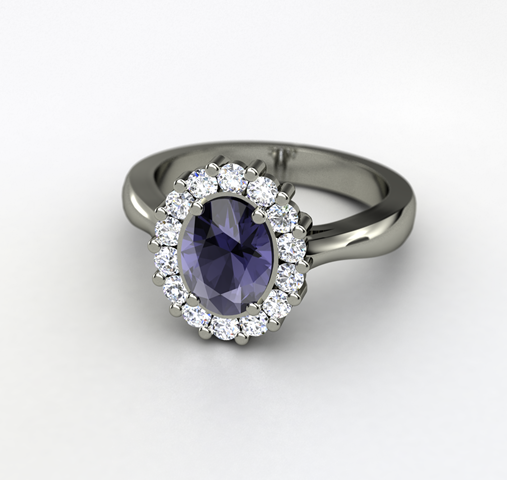 Gemvara.com is a customizable fine jewelry website with over 1,500 original designs, all of which can be customized by 26 gemstones and 8 precious metals. 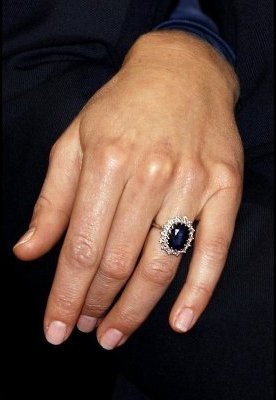 Their Princess Kate Ring is a luxurious replica, in dazzling platinum with an oval blue sapphire surrounded by diamonds. Aspiring princesses can flaunt the look for $3,554.00. 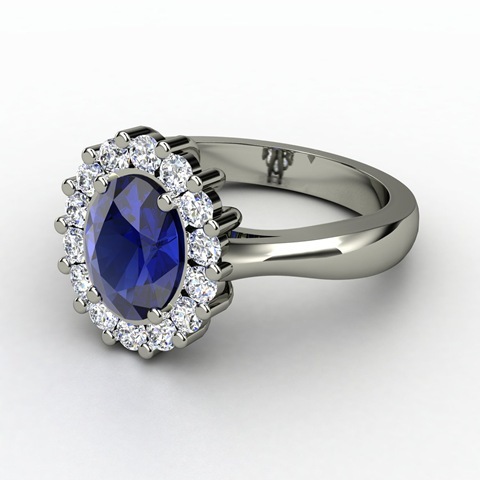 For those on a budget, customize the Princess Kate Ring in sterling silver with iolite (known as the “water sapphire”) and white sapphires for just $401.00!